Skeletal and envelope volume measurements are important. However, the combination of the two allows the user to calculate percent porosity and the total pore volume. Scientists understand that the physical, mechanical, and pharmacokinetic properties of tablets can be influenced by the settings of a tablet press. AccuPyc and GeoPyc pycnometer enable scientists to quickly determine the skeletal density, envelope density, total pore volume and percent porosity. The closed-cell pore volume of tablets produced with various press settings can also be discovered. Skeletal density is measured by AccuPyc, which is included in the setup parameters for envelope density. GeoPyc calculates and reports the percent porosity and total pore volume of the ribbon. This data is useful in controlling mechanical properties of the material and compression force settings on the roller compactor, as well as tablet press settings. GeoPyc uses a quasi-fluid displacement medium composed of non-hazardous microspheres with a high degree of flowability. This does not wet the sample or fill its pores. 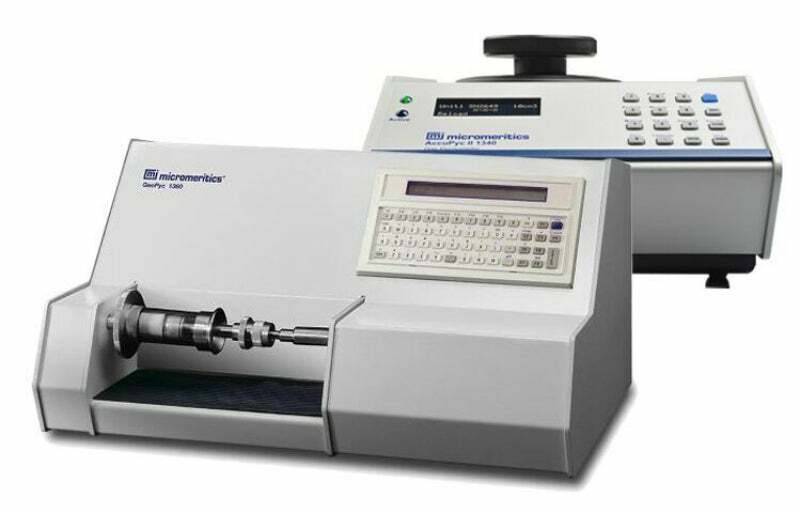 AccuPyc II, featuring its gas displacement pycnometry system, uses a reliable non-destructive technique that protects the integrity of the product being tested. Minimise cost and space requirements with low maintenance and small footprint. Maximise results with greater analysis accuracy, repeatability, reproducibility and speed.